The sabka saath sabka vikas party has made history in Uttar Pradesh (UP). Last week, a Hindu priest, a Rajput and five-time member of Parliament from Gorakhpur, Yogi Adityanath, was sworn in as the state’s 32nd chief minister. Yogi Adityanath –anointed Ajay Singh at birth – is a pahadi Rajput with roots in Uttarakhand. The yogi has beaten home minister Rajnath Singh, also a Rajput, to the post. Singh was chief minister from 2000-2002 but is not popular as a Rajput leader as such. He had tried to weld together a new, most-backward grouping in UP that had proved abortive. The Bharatiya Janata Party (BJP), on two other occasions, had made Other Backward Class (OBC) leader Kalyan Singh and Ram Prakash Gupta, a bania, the chief minister. By electing Yogi Adityanath, the BJP has pandered to the party’s upper caste core vote base – but not because Adityanath has a following among Brahmins or Rajputs either. The party has instead drifted from the development narrative, seeing the scale of its sweep. It has decided to firmly interpret the win as a pro-Hindutva verdict and may try to paper over caste differences with communalism. Nevertheless, there is a deep caste symbolism in this appointment, which will not be lost on the people of UP. HISTORICALLY the Rajputs have positioned themselves as the great defenders of the Hindu faith. More recently, they have played the role of the musclemen of Hindutva. Yogi Adityanath runs a militaristic vigilante-style Hindu Yuva Vahini, or Hindu Youth Vehicle, with thousands of armed volunteers. He thus represents a ‘martial’ caste playing the tune of militant Hinduism. For sure, he is not known for development. How the new UP government will bring together the diverse strands of the state’s population, considering the party’s sweep cuts across caste, age and gender, is anybody’s guess. The big section that didn’t vote for BJP – never mind defensive claims from BJP leaders – is the Muslims. They would view Adityanath as chief minister in the same light as Hindus would see Azam Khan being put in that post. The OBC assertion and aspiration sparked by the BJP victory would also be drenched by this appointment. Indeed, the BJP had fielded many a Rajput in the just-concluded UP polls, and they garnered over 50 of the party’s 312 seats. The party may want to acknowledge their contribution by sending up the yogi to Lucknow. Yet, it is equally true that the BJP fielded around 50 backward caste and 70 OBC candidates, Keshav Prasad Maurya in particular. Maurya’s supporters led protests in Lucknow on Saturday, demanding he be made chief minister. The BJP was being feted for drumming up support from “non-Yadav OBCs” – a purely political term with no basis in the UP caste structure – and yet many had seriously expected an OBC leader would bubble up for this post. The fact is that Yogi Adityanath is a Hindutva rabble-rouser and strongman whose domain was, thus far, limited to his eastern UP stronghold. Seen from a caste angle, perhaps the home minister, the other Rajput contender, would not have wanted to jump into trying and managing this kind of a verdict. The caste extremes that have cast their lot with the BJP are socially and economically not going to prove easy to manage. To send Adityanath to manage these poles is to confirm that the story of UP elections was, ultimately, low-grade but deep-set communal polarisation. 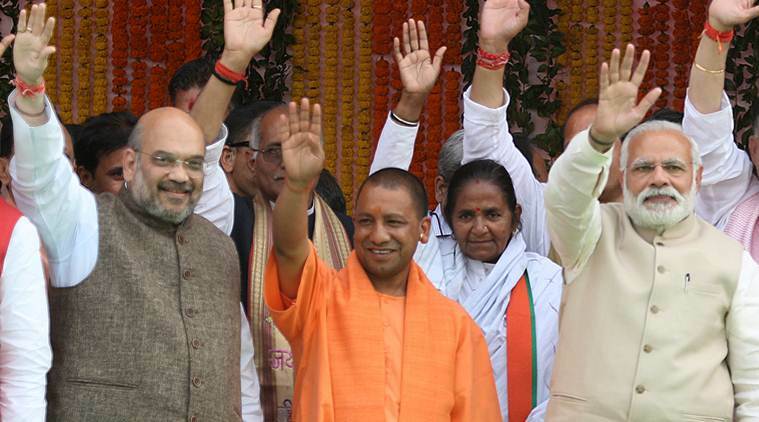 The selection of Yogi Adityanath is also a political masterstroke for the BJP. Now, it has the polarisation in western UP to rely on thanks to the Jats, while Rajnath Singh’s strong position in central UP upper caste strongholds will hold sway in years to come and eastern UP also falls within the kitty of Hindutva. In the post-1982 scenario, the Congress turned to the Hindu card in UP, with sloganeering to the effect that ‘Hindus cannot be neglected’ – implying that they were being ignored. Yogi Adityanath is the next new normal for UP, whether it is minus the camouflage of vikas or plus it, is to be seen. In that context, truth be told, the BJP might well have preferred an OBC chief minister face instead of Yogi Adityanath – but with the same politics.